While on a "temping" assignment at another Family Dollar store, I got a chance to eat at a place that I've longed to review. Best Kept Secret has been on my radar for a while, but I never had the time to focus on. Prior to my "temp" job, I made just one visit to the restaurant. 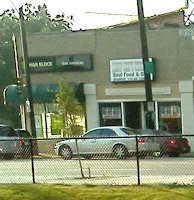 During my January 2011 outing, I got the fried chicken with turnip greens and spaghetti. From what I could remember, the meal was good and the service was great. I hoped that my subsequent visits there would result in similar experiences, and the restaurant didn't disappoint. The first meal was similar to what I got last year. I chose the fried chicken again, but my two sides were macaroni & cheese and black eye peas. The chicken, consisting of a thigh and a drumstick, tasted the same as it did last year. It took twenty minutes to cook and was piping hot. The chicken was lightly breaded with a modest amount of seasoning, which was a change of pace from places like KFC and Popeye's. I didn't ask what kind of oil that it used to cook the chicken, but whatever it uses isn't fatty or overly greasy. The end result was fried chicken that had a buttery flavor that wasn’t spicy. Although the chicken isn't the same caliber as Gus's or Uncle Lou's, it can hold it’s own with most restaurants in Memphis. The sides were okay for the most part. The macaroni and cheese were well seasoned with black pepper that could either be hit or miss, depending on particular taste. Personally, I liked it despite the fact that the “cheese” was watery. The black eye peas weren't any different from what I had in the past. However, because of avid reading of the blog Memphis Que, I followed its example by pouring Bruce's Green Hot Pepper Sauce on my peas. I'm glad I did, for it made them more palatable to someone who isn't a fan of black eye peas. Both sides went well with the fried chicken and rounded out my meal. I almost forgot to mention the cornbread rolls that come with nearly every entrée (burgers being the exception). The rolls are fluffy, sweet and slightly buttery. 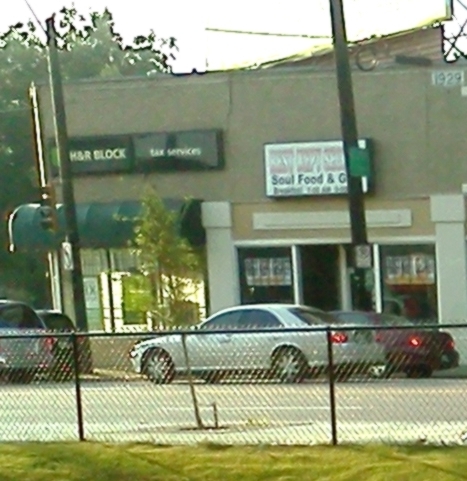 They stand well on their own, although not to the degree of the cornbread sticks of Downtown Memphis’ The Little Tea Shop. This served me well because I ate them while my chicken cooled (it scorched my mouth during my first visit). As an appetizer, the rolls served its purpose, allowing me to eat my lunch in comfort. 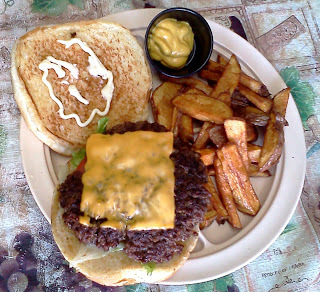 Instead of talking about my next meal, I will skip to the last one I had, the cheeseburger with fries. There isn't much to say about either, other than to say that the combo isn't much different from most places. The ground beef was seasoned with a mix of salt and pepper and cooked "well done." The black pepper stood out, which along with lettuce, tomato, mayo and mustard (on the side) made for a good burger. On a scale of five, I will give it a "3." The fries (with the exception of a few) weren't crispy. They had a soft and mushy texture, probably the result of being baked in an oven. The fries were seasoned with salt and what I believe was dry rub seasoning, which resulted in a nice flavor that complemented the burger. Now that I've mentioned two of the meals that I had, I want to highlight something that I've never had before, pork neck bones. A traditional staple, neck bones have been a part of African-American culture for centuries. During slavery, blacks had to make do with scraps that their masters left them with. From neck bones to chitterlings (aka “chitlins” and pig intestines), slaves had to use whatever was at their disposal to feed themselves. This ultimately culminated in the American cuisine known as "Soul Food" that is popular among all races throughout the country. For most who don't earn much income, "Soul Food" is the best way to get the most out of their dollars. As an African-American who grew up in a middle-class household, I was fortunate that two college-educated parents provided my siblings and me with plenty of good food when we were growing up. Quite often, we would have roast beef, fried chicken, spaghetti and other foods that most Americans take for granted. Whenever we had pork, it would be in the form of country ham or barbecue ribs. On the other hand, consuming things like pig feet and chitterlings was and still is a sign of poverty. Until recently, this was something that I couldn't relate to. However, my long-term unemployment has forced me to see things from a different perspective. As a result, I have had to change my lifestyle in many ways, including my diet. Although I still dine out on occasion (this blog wouldn't exist if I didn't), I often eat whatever I can afford. So far, I haven’t had to resort to the same type of food that my ancestors did for their survival. 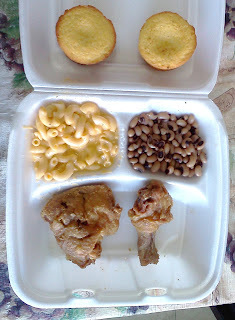 In dining at Best Kept Secret, I discovered an array of authentic "Soul Food" on the menu. I eventually chose the neck bones, basing my decision on a review that I read on the blog Memphis Que that described the experience in great detail. It's amusing that I, a black man who was born and raised in the South, had to learn about this African-American staple from a white guy. But as I said earlier, I grew up in a household that was more like The Huxtables than The Evans (TV shows "The Cosby Show" versus "Good Times"). Therefore, as someone who just turned 46 years old this month, I acquainted myself to this pork entrée. From what I learned about it, I assumed that neck bones consisted mostly of bones with little meat around it. What I got at Best Kept Secret really surprised me. The neck bones that I got were more than I expected. Instead of getting a plate of modestly meaty bones, the restaurant served me a pound of tender roasted pork. Actually, it was more like three-quarters of pork to one-quarter of neck bones, but it was still more than I expected. The amount of meat was more than enough for me, which along with turnip greens and Northern beans made for a full meal. The meat from neck bones isn't any different from many parts of the pig such as the shoulder. Like with ribs, roasting neck bones is a time-consuming process that requires patience and know-how. When done right, the meat should roast (or "smoke") to a point where even a kindergartener can pull it off the bone with ease. With regards to the neck bones I had, they were perfectly roasted. The meat was tender and lean with very little (if any) seasoning. For my first plate of neck bones, I was very impressed with what I had because it was delicious. 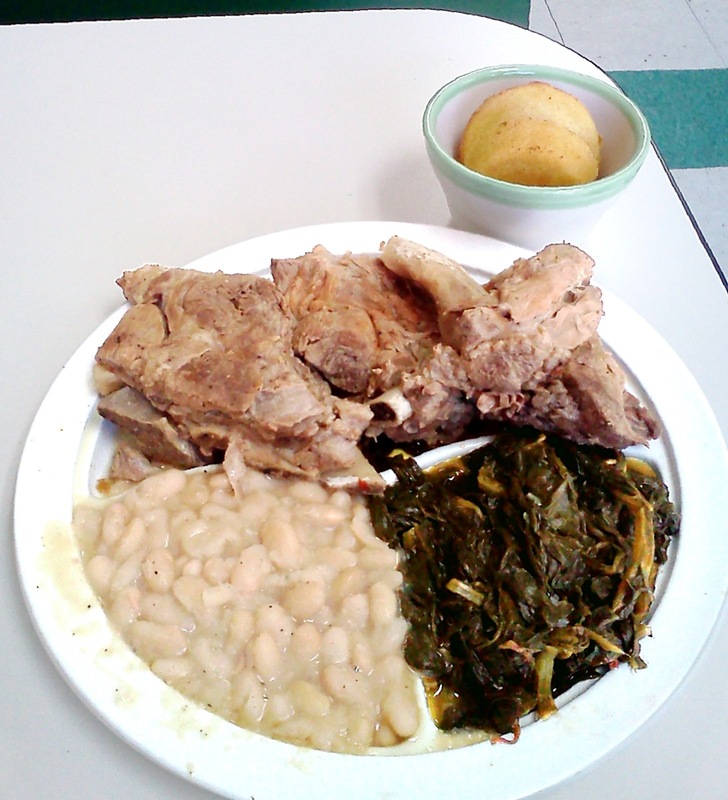 In addition to the neck bones, I got turnip greens and Northern beans to complete my meal. The turnip greens weren't anything special, but became zesty after I sprinkled Bruce's Green Hot Pepper Sauce on them (although for me, sweet pickle juice works better). The Northern beans tasted about as I expected, so I spiced them up with Kurtz Louisiana Hot Sauce. Collectively, both side items meshed well enough with the neck bones to make it a good and memorable lunch. 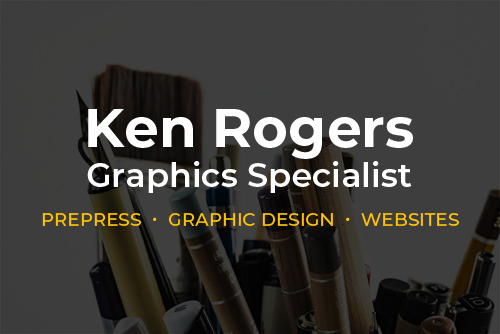 be the site for American Studios. As much as I enjoyed my lunches at Best Kept Secret, I must say that the service was even better. During the three days that I ate there, a very attentive young man eagerly saw to all of my needs. This was something that I didn't expect from a "Soul Food" joint in North Memphis, but this goes to show that you can't judge a book by its cover. When I placed the first order with my server, it was at the counter located in the same area as the kitchen. When I attempted to pay, the kid (which he literally is) told me that he would bring my order out and I could pay afterwards. This took me by surprise, but I rolled with it and waited for my order. During my wait, he constantly checked to see if I was alright. It soon dawned on me that I was being "served" and needed to tip accordingly. Unfortunately, I barely had the $6.56 to pay for lunch (this also was the cost of my neck bone plate). I dreaded that he would see me as another black guy who doesn't tip, a stereotype that I try to avoid like the plague. Even though my server didn't get tipped that day, he didn't hold a grudge about it. For the next two days, he waited on me with the same enthusiasm that he had on my first visit. For his efforts, I made sure that he got the appropriate gratuity. It was well earned, for my server's professionalism was very impressive. If the kid ever applies to work at an upscale restaurant like the Majestic Grille, he has my endorsement. Compared to the Majestic and other classy restaurants, the customer service from this server and others who waited on me was first class. It’s this kind of service that will keep me a loyal customer even if Best Kept Secret decides to serve only chitlins (YUCK!). To sum it up, Best Kept Secret is a nice restaurant that serves authentic "Soul Food." Overall, everything I had during my three visits was good. 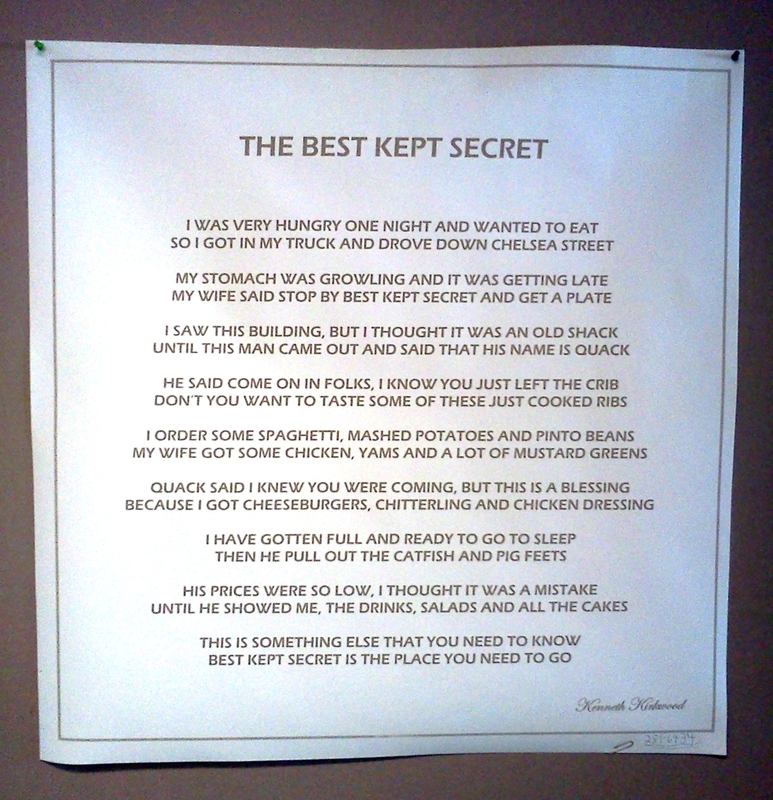 Combined with great customer service (epitomized by a poster displayed in the restaurant; see below), Best Kept Secret is a fine establishment. I hope others (particularly those who work nearby at St. Jude Children's Research Hospital) will discover it.